Perimenopause can cause several symptoms, from hot flashes to vaginal dryness and irregular periods. It is becoming more popular for women to use natural remedies for relief from perimenopause symptoms. Many natural remedies are available - but which have the best track record for treating hormone imbalance, the underlying cause of many menopausal symptoms? 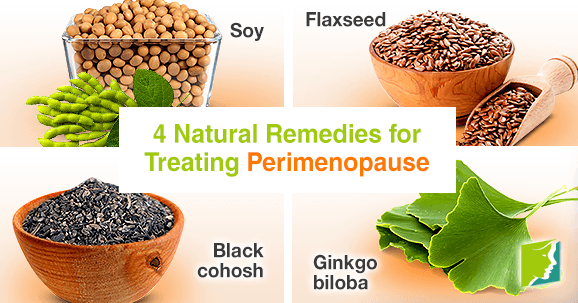 Continue reading to find out more about 4 natural remedies for treating perimenopause. Regular servings of soy product can go a long way in treating the symptoms of perimenopause. Rich in protein and isoflavones, soy contains plant-based estrogens which mimic the effects of estrogen in the female body. These estrogens help to restore hormone balance. Sources of soy include soy beans, tofu, and tempeh, and soy-based products, such as soy milk, soy cheese, and soy yogurt. Sprinkling 25 grams or one and a half tablespoons of flaxseed on your favorite breakfast cereal can help you start your day on the right foot. Flax is the richest known source of phytoestrogens and contains omega-3 fatty acids, which are linked with helping to prevent high cholesterol, heart disease, and some cancers. Native to the woods of eastern North America, more research needs to be done on this herb that is believed to fight the symptoms of perimenopause. One study has suggested that fukinolic acid, a compound found in black cohosh, may be responsible for eliminating the symptoms of perimenopause. Black cohosh is available in tablets, tinctures, or teas, and is widely available for purchase. However, be careful when using this herb, it can cause headaches and nausea. Ginkgo biloba is the champion herb of blood circulation and cognitive function. It also helps combat depression, a common psychological issue women can experience during perimenopause. Ginkgo biloba is sold as a tea, powder, extract, or as a skin product. Choose unsaturated fats like olive oil, nuts, and fish, in place of saturated fats like red meat, animal fat, margarine, and processed foods that contain partially hydrogenated oil. Reduce salt intake, this can be done by decreasing your intake of processed foods. Eat at least two portions of oily fish a week, which includes sardines, mackerel, fresh tuna, and salmon. Increasing intake of dietary fiber, which comes in beans, legumes, bran, raspberries, coconut, artichoke, and other vegetables. Don't forget to continue eating the recommended five servings of fruits and vegetables each day! You should consult with your doctor before introducing these treatments into your daily lifestyle. Even natural remedies can have side effects, and may have adverse impacts due to other medication taken or another factor. Click on the following link for additional information on more ways to handle perimenopause effectively. Perimenopause is defined as the time leading up to menopause. During this stage women can experience some unpleasant side effects. Perimenopausal symptoms can be distressing, but an active lifestyle can help reduce symptoms.